The Queem of the Barnyard is one of the sketches for Marie Antoinette. The six are Marie Antoinette, Let the Eat Cake, Queen of the Barnyard (Le Petit Hameau de la Reine), Holding the Rose, Last Chapter, Dancing Parties. 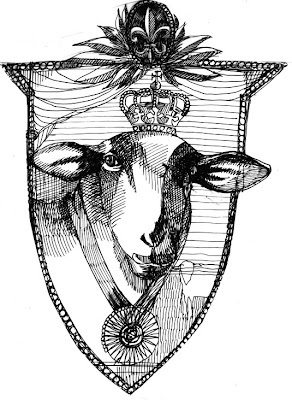 The Queen of the Barnyard sketch represents the "pampered farm animals that she and her fellow "shepardesses" (MA referred to her attendants as Shepardesses when they were in the mock farm at Versailles). As an aside, I was googling Le Hameau and was dumbstruck with the sheer 1780's version of the Enchanted Kingdom at Disneyland. It truly is designed as a fab confab with all sorts of experiences all mooshed togethere in one structure. The petit hameau was small, a rustic but in essence ersatz farm (or ferme ornee) meant to evoke a peasant village in Normandy, built on the far side of a landscaped pond. Created in 1783, to designs of the Queen's favoured architect, Richard Mique, the hamlet was complete with farmhouse, dairy, and mill. Here, it was said, the Queen and her attendants would dress as shepherdesses and milkmaids. Particularly docile, hand-picked cows would be cleaned. These cows would be milked by the ladies, with porcelain milk churns painted to imitate wood specially made by the royal porcelain manufactory at Sèvres. These churns and pails featured the Queen's monogram. The simple and rustic ambiance at the petit hameau has been evoked in paintings by Fragonard; however, inside the farmhouse, the rooms were far from simple, featuring the luxury and comfort to which Marie Antoinette and her ladies were accustomed. Yet, the rooms at the petit hameau allowed for more intimacy than the grand salons at Versailles, or at the Petit Trianon itself. Such model farms operating under principles espoused by the Physiocrats, were fashionable among the French aristocracy at the time, and one primary purpose of the hameau was to add to the ambiance of the Petit Trianon, giving the illusion that the Trianon itself was deep in the countryside rather than within the confines of Versailles. Maybe we should set up some little fun spot like this in the backyard? Unfortunately, for us, it would not be an escape from anything...just plain more work! Got the WordPress machine going yesterday--learning incrementally what it takes to put up a WordPress blog, the themes available for free or for pay (there are some spectacular "magazine" formats for $79. which would take hours to program and minutes to customize the colors, fonts, headers). Picked a simple layout and put up all the links (will edit as I put some silly ones up too) for the Hartford blog. Once we get rolling, it'll be great and hopefully, I can lean on some other students to add to the content veruse having this as another full time tssk for me. You can backup a blogger page (like this) and reflow it innto a free or paid theme (which the magazine format is ticking my fancy) which is going to happen for this site as it will allow me a bit more creative freedom, allow me to set up all sorts of pages for my projects and allow me a chance to backup and save the work as I go versus being dependant on Google Blogger which is a tremendous, simple resource that promotes blogging for all. After all, isn't that what this is all about? Blogging, writing, putting out content! Got a preview copy of Communications Arts Illustration Annual (due out in July) with work from Scott Bakal (UH 2007), Greg Newbold (UH 2009), Mark Bender (SU 2006) and yours truly (UH 2009) in the ranks. Interesting group and selection. Check it out on the newsstands soon. R. still in Portland. K and A and I will go to Smith Woods this morning and then off to complete the shopping/phone exchange that needs to happen prior to K going to Fredonia, me to Hartford and the day we get back, A goes to Cornell. So, box fans, phones, underwear. Done. Would love to get to Munson Rd Amish Farmer's Market and to the lake today. The celestial faucet has stopped for now. The grass is radiant. The nicotiana needs to dry out as do the geraniums. Monarda is tall (36") and ready to blow.